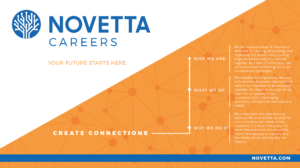 Novetta is an advanced analytics company that bridges the gap between what our clients currently can do and what they aspire to achieve by solving complex problems. We do this by helping our clients find clarity from complexity in dealing with massive disparate data sets that were never intended to be analyzed together. By mastering scale and speed our advanced analytics solutions deliver the actionable insights needed to help our customers detect threat and fraud, protect high value networks and improve the bottom line. Click image to download. 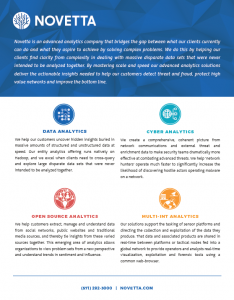 Novetta’s Advanced Analytics bring instant clarity to even the most opaque big data data sets. 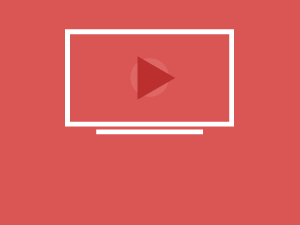 Unifiying views of your network empowers better decision making, leads to new insights, and reveals new patterns, relationships, and trends that give your enterprise an information edge. We’re a family of talented, technical experts solving some of the nation’s most complex, large-scale technology problems. Watch CEO Peter LaMontagne talk about our passions, interdisciplinary competencies, and our roots in national security.